Bright, juicy tomatoes that burst with flavor. Crisp, dry rosé wine. Briny olives. Flaky pastry drenched in sweet honey and pistachios. The flavors of the Mediterranean are as diverse as they are mouthwatering. The region spans three continents (Europe, Asia, and Africa) and includes many distinct cultures. Each one has its own unique culinary tradition. As you travel through the Mediterranean with us, you’ll get to experience the differences and the similarities among a variety of Mediterranean cuisines—Spanish, Provençal, Italian, Greek, Turkish, and Levantine, to name just a few. When we asked our travel community on Instagram what they love most about cruising to the Mediterranean, the answer was overwhelmingly “the food!” Luckily, we offer dozens of culinary-based shore excursions in the Med so you can experience it all. But before you set sail, whet your appetite by reading our guide to Mediterranean cuisine. Many delicious regional cuisines fall under the umbrella of Spanish cuisine, including Basque, Andalusian, Catalan, and Valencian. Daydreaming of tapas? Cruise to Seville, where they’re a mainstay of the Andalusian fare synonymous with the city. Another famous Spanish dish, paella, is a staple of Valencian cooking. And you can learn to make it yourself while you’re there! We offer a Cruise Global, Taste Local shore excursion in Valencia that takes guests off the beaten path, to a quaint country farmhouse. The experience includes a lesson on making paella—and the opportunity to enjoy some for yourself, of course. Alkimia: An intimate Michelin-starred restaurant from celebrity chef Jordi Vilà that blends modern and traditional. Lomo Bajo: This smaller offshoot of the meat-focused restaurant Lomo Alto serves up sandwiches that are so much more than you realized a sandwich could be. At both restaurants, quality meats are aged slowly and cooked over coals with an almost scientific precision. Quimet & Quimet: A standing-room-only tapas bar with a 100-year-old history and even more impressive reputation. El Cellar de Can Roca: A creative Catalan restaurant with three Michelin stars in the town of Girona, less than a 90-minute drive from Barcelona. Making the trip here is a must for foodies who saw its chef, Jordi Roca, featured on the Netflix series Chef’s Table. One of the best places to experience Barcelona’s food culture is at the famous Boqueria Food Market. Our Executive Chef will show you around ­and prepare a delicious dinner using the market’s freshest finds. It’s all part of our Local Flavors of Barcelona shore excursion. Of all Spain’s delectable cuisines, the one to receive the most worldwide acclaim is Basque. The Basque region has the most Michelin-starred restaurants per capita of anywhere in the world. In Bilbao, the restaurant Azurmendi has achieved an impressive three Michelin-star rating. A visit to the Guggenheim Museum (Bilbao’s claim to fame) followed by a meal at a Michelin-starred restaurant s a wonderful way to spend the day. Sounds mouthwatering, right? Experience the joys of Spanish cuisine when you cruise the Mediterranean on one of these voyages that call on Spain. We love French cuisine so much, we devoted a series of five blog posts to it last year—and part two covered the cuisine of the sun-kissed South of France. The cuisine of Provence is all about fresh herbs, succulent seafood, and crisp wines. The region is famous for its herbs de Provence, a combination of bundled herbs that typically includes marjoram, oregano, rosemary, savory, and thyme. When we think of Provençal cuisine, we think of three dishes in particular: bouillabaisse, ratatouille, and socca. Bouillabaisse is a classic seafood stew that hails from Marseilles, France. It typically consists of an assortment of fish and shellfish, as well as vegetables, herbs, and a broth served over bread. Want to make it at home? Check out Julia Child’s recipe on the Smithsonian website. Ratatouille is more than a charming animated film about a rat-turned-chef. It’s also a delicious dish of stewed vegetables that originated in Nice, France. Tomatoes are the foundation of the dish, which traditionally includes onions, eggplant, zucchini, herbs, and more. Learn to make it from the folks at Bon Appetit. Socca is another specialty that hails from Nice, France. This simple flatbread made from chickpea flour, water, and oil is a street-food favorite. It’s best eaten in Provence, cooked over a wood-fired oven. But you can make it at home, too—food blogger David Lebowitz says he’s been perfecting his recipe for years. Of course, it will be a lot easier to produce these delicious Provençal dishes at home once you’ve had a lesson from a pro. In Sanary-sur-Mer, award-winning chef Rene Berard offers a fantastic Mediterranean cooking class in a beautiful rustic home. It’s a shore excursion that everyone with an interest in food should experience! Does the cuisine of the French Riviera have your stomach rumbling? Browse our Mediterranean voyages that call on France. Mediterranean cuisine in Italy tends to include many of the country’s coastal regions like Sicily, Campania, and Liguria. 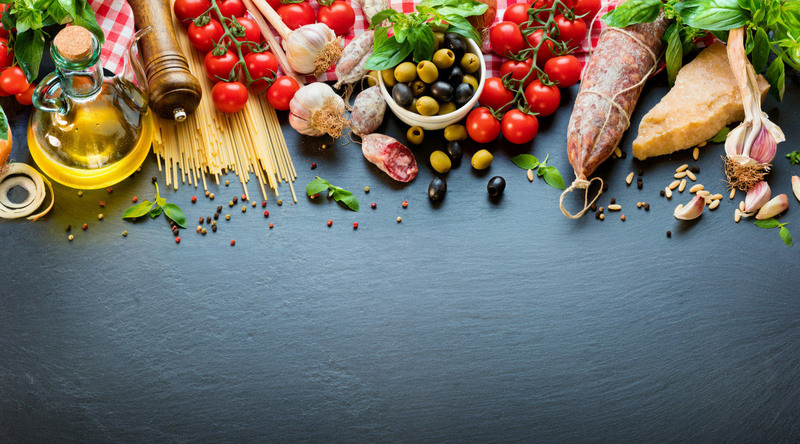 Italian food in the northern and inland regions tend to favor creamy risottos, red meat dishes, and rich truffles while the Mediterranean regions favor olive oil, pasta, tomato sauces, and seafood. The cuisine of Sicily has many commonalities with other Italian regional cuisines, but it also has Arabian, Greek, Spanish, and French influences. Sicily is renowned for its street food, like crispy fried risotto croquettes called arancine. It also serves up delicious sweets, like its world-famous cannoli—a tube-shaped shell of fried pastry with a sweet, creamy ricotta filling. Sicilian pizza differs from most other Italian pizzas, too. It’s typically rectangular with a thick, doughy crust similar to focaccia and topped with tomatoes, onions, anchovies, herbs, and a strong local cheese. Sicily’s rich, volcanic soil is ideal for winemaking. Red, white, and dessert wines are produced on the island. Perhaps Sicily’s most famous wine is the dessert wine Marsala, which originates from a town of the same name. It’s often served as an aperitif between courses and is a common ingredient in Italian cooking. The town and the wine both have a fascinating history worth learning about when there—you can visit during a shore excursion when calling on the port of Trapani, Sicily. Neapolitan cuisine is the food of Naples and the surrounding Campania region. It uses components from rural farm cooking (like pasta, rustic breads, and fresh vegetables), as well as lots of fish and seafood. Naples is probably most famous as the birthplace of modern pizza. A true Neapolitan pizza has a thin, round crust and must be topped with San Marzano tomatoes and Mozzarella di Bufala Campana. Where one can find the best pizza in Naples is a topic of hot debate, but popular opinion usually comes down to one of three restaurants, all on Via dei Tribunali: Pizzeria di Matteo, Pizzeria I Decumani, and Gino Sorbillo. Expect them to be busy, and decide which one to dine at based on their hours of operation and length of queues. Pasta is another principal dish in Neapolitan cuisine, particularly ones that pair well with seafood. While in Campania, you’ll see lots of spaghetti and linguine paired with shellfish. Meaty Bolognese and Genovese sauces are also popular in the area. Vegetarian? Look out for spaghetti alla puttanesca on menus. This spaghetti dish tossed in tomato sauce and served with salty capers and black olives, is a regional specialty. South of Naples is Sorrento and the quaint villages along the Amalfi Coast, where olive oil and limoncello are produced. Food and wine lovers will love our shore excursion that includes visiting a local market with our Executive Chef and touring a Michelin-starred restaurant and wine cellar with a sommelier. Liguria is the region most closely associated with the Italian Riviera and the travel hotspot Cinque Terre. Fresh, salty anchovies are a quintessential ingredient in this culinary tradition, along with pillowy focaccia, and fresh, zippy pesto. A jar of basil pesto makes a great souvenir from Cinque Terre—or even better, learn to make your own when you cruise to Cinque Terre (via Portovenere) with Azamara. When you dine out in Cinque Terre or the surrounding region, begin your meal by ordering antipasti ai frutti di mare. This is like Liguria’s answer to a charcuterie board—an assortment of fresh seafood like mussels, squid, shrimp, and whatever else was caught that day. Monterosso is home to the best beaches in Cinque Terre, and has a resort town feel rather than the quaint atmosphere of the other villages. MIKY is one of the town’s most beloved restaurants, thanks to the delicious fish dishes and a fun, friendly ambiance. It’s hard to call out one of the five villages as the most picturesque, but if pressed we’d declare Vernazza the winner. Soak up the stunning views on the terrace at Ristorante Belforte, whose menu offers an extensive array of seafood options. Corniglia is the most difficult village to get to, and thus the quietest. If you make the hike up, reward yourself by enjoying dinner with an epic view. Ristorante La Posada is a homey hidden gem overlooking the sparkling Ligurian Sea. Manarola is known for its incredible views, plentiful vineyards, and historic graveyard. Rather than grabbing a bite to eat along the main waterfront strip, climb the hill to Trattoria dal Billy where you’ll be equally impressed by the epic views and the squid ink pasta. Enoteca Dau Cila, a romantic seaside restaurant with an intimate wine cellar. Pack your appetite for an Italian cruise—you’ll need it! Take this pocket guide to eating in Italy before you go and you’ll know exactly what to order in each port. Browse itineraries here. The cuisines of Greece and Turkey have their differences, but both are part of the larger tradition of Ottoman cuisine—the food of the historic Ottoman empire which ruled the area for hundreds of years. Turkish cuisine varies across the country, with food in the capital city of Istanbul most heavily influenced by Ottoman royalty’s culinary traditions. Turkish fare near Istanbul includes rice dishes, kofte (ground, spiced meat), stuffed grape leaves, and fish. In southern Turkey, cuisine favors mezes, a collection of hot and cold small plates served at the beginning of the meal, meat kebabs, and baklava pastry for dessert. When you cruise to Kusadasi, Turkey with Azamara, you can learn about Turkish cuisine in a hands-on environment, at a local family’s home. If you ask us, there’s no better travel souvenir than a new skill and some incredible memories. One of the best things about cruising to Greece is how easily you can get from one destination to the next—especially when it comes to the islands of Greece. Here’s what you should eat in some of the most popular Greek travel destinations. In Athens, order a gyro. This popular street food is a pita stuffed with meat cooked on a vertical rotisserie, as well as French fries, tomatoes, onions, and tzatziki. You’ll find them all over the city. For a delicious taste of culinary history, grab yours at Bairaktaris Taverna in Monastirakiou Square. It’s been around since 1879. Santorini is known for its fava beans, but they’re nothing like the fava beans you’re used to. Take our word for it, and order them. In Oia, the restaurant Ambrosia serves a Santorini Fava appetizer, among other local favorites. And the restaurant’s views of the volcano are unmatched. As a food lover cruising to Santorini, you won’t want to miss out on the Secrets of Greek Cuisine shore excursion. It includes a hands-on cooking class with one of the region’s top culinary experts. Mykonos is the nightlife capital of Greece and the perfect place to enjoy late-night mezes paired with Greek wine. The water views of Little Venice are wonderful, but they can be touristy and overpriced. Head a few winding streets inland if you want to dine like a local. Eva’s Garden boasts a lush, romantic patio and a mezes menu that offers favorites like spinach pie and grilled halloumi cheese. If nightlife isn’t your thing, learn to prepare mezes for yourself at a cooking class in a local home. Intimate, authentic experiences like this one are why we love traveling so much—and aren’t all the best friendships fostered over food? We can’t wait to introduce you to the flavors of Greece during a Mediterranean cruise. Which voyage will you join us on? Levantine cuisine is a type of Arabian cuisine commonly associated with the historic Levant region, which includes modern-day countries like Syria, Lebanon, Jordan, Palestine, and Israel. Like Ottoman cuisine, small plates called mezzes are integral to this fare. Meat kebabs, stuffed grape leaf rolls, and baklava are also common in both culinary traditions. Chickpeas are a key ingredient in quintessential Levantine dishes like creamy hummus and crispy falafel. Lentils are also popular, served cold as kofta or warm in mujaddara. In Haifa, Israel, you can learn to prepare meat kebabs, grape leaf rolls, and other popular dishes during a cooking class with a local family. Food is at the heart of social life and traditions in the Mediterranean. Meals are prepared with care, using only the best ingredients. They’re shared together, over long conversations and with lots of wine. On a trip to the Med, one of the best things you can come away with is an appreciation for the important role food plays in our lives. Your best meal in the Mediterranean could be at a renowned Michelin-starred restaurant or a tiny mom-and-pop restaurant with three tables and no frills. But no matter where you go, don’t forget to get your hands a little dirty, too. Take a cooking class and learn to knead flour, oil, and water until it becomes sticky dough for bread. Visit a farm and touch the rich soil that produces the most flavorful vegetables you’ll ever taste. Learn to select the freshest fish at a local market. It’s these experiences that will make your cruise to the Mediterranean memorable and unique. The only question now is when (and where) will you join us?